Pharmacy prices have increased by a fifth this year despite the sector “going over a bump in the road”, property adviser Christie & Co has revealed. The broker has seen a 20% rise in the average price of pharmacies in the four months up to May compared to the same period in 2017, it told C+D last month (May 2). 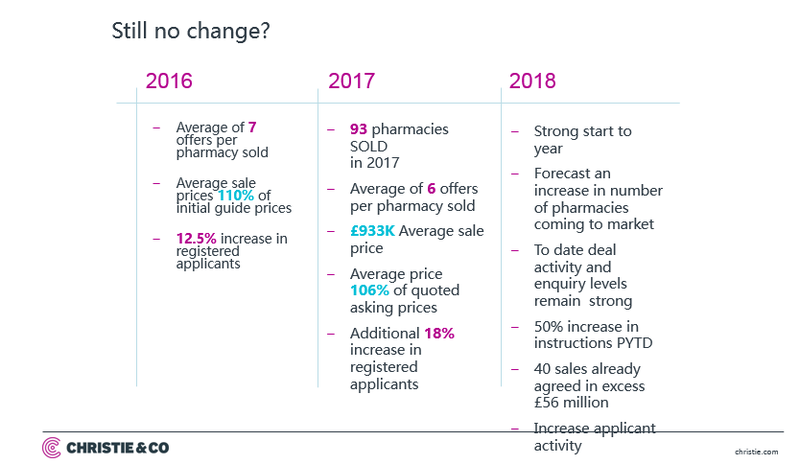 “Three or four years” ago, the average pharmacy was selling for between £550,000 and £600,000, while in 2017 the average sale price was £933,000, Christie & Co head of pharmacy Tony Evans explained (see image below). “That's down to the asset being more valuable because of the dispensing. There are better quality pharmacies going to market,” he said. However, the average number of offers per pharmacy has halved from eight in 2015 to “about four” in 2018, he continued. Nevertheless, there is “still competitive tension”. 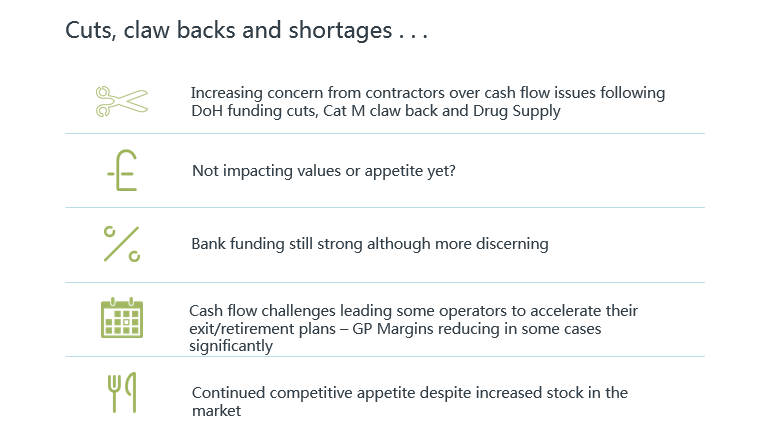 The “appetite for pharmacies is still there” despite the sector’s “bump in the road” caused by funding cuts in England, a category M clawback, and medicines supply issues, Mr Evans said. According to head of medical valuation Chris Vowles, it is smaller pharmacy chains that are making the most acquisitions. “Some of the larger players in the market have looked to consolidate and grow their existing business internally, so they are not necessarily going out and buying pharmacies at the moment,” he said. Mr Evans added that Christie & Co is “seeing a lot of smaller independent [multiples]” who are “very active” and looking to expand. Are you thinking of buying a pharmacy? If you keep an eye on the market it is obvious that bigger and better pharmacies are now openly marketed. I would suggest this is because their owners are deciding to get out before its to late. The other thing going is that owners who are not near retirement age have a choice, expand or die, and this is maintaing demand, its a small part of the market, hence the number of offers per shop has dropped, as has the ammount over the offer price achieved. To those fools who say that profits are maintained by slashing the wages of the oppressed workers, NO this can not be done, wages can not be dropped, unless you are self empoyed, and you are self employed to pay less tax, you should have taken a permenent position. This would have given you job security and employment rights. The self employed locus are in the same position as us owners, subject to the ups and downs of goverment policy, but with some small tax benifits. Delectable skeptic has the right take on this. If the only pharmacies that are selling are those with high volume prescriptions the average price will obviously rise. There is nowhere near enough infomation to conclude there "must" be or have been excess profits made. With well over 20 years of expeience in owning/running several pharmacies I have never known a worse situation. This is very interesting that price ares going up despite the cuts.So in effect there must be excessive profits made prior to cuts and reasonably high profits after the cuts. The real suffering is to the pharmacist who are employed by the owners of pharmacist as their wages are slashed to keeep owners profits excessive as before the cuts. PSNC threatened the Department of Health that 1500 shops will close and services will suffer.I cannot see the evidence of that. I notice lexon snapped up 10 shops in north west recently and other multiples are also snapping them up around the country.Are you seriously telling me that with cuts imposed by the government pharmacies will close. Total nonsense without any hard evidence.The ones that are closing were unviable in the first place and also the larger multiple are selling their unviable shops to independents at very high prices. It is very strange indeed!!! It is foolish to think a business losing money would be in position to expand and buy another business losing money. Look at other high street retailers which are closing everyday and not expanding if they loose money. As for wages for pharmacist whether employed or locum you really do need to open your eyes.Try getting a job and see what wages and hours are on offer.God help if you have to find a job Charles. We are not all lucky to have so much money to afford these pharmacies before and after the cuts and have permanent jobs. People do have to move around the country and change Jobs according to their circumstances. And Lloyds would never sell something which makes them that cash that they love so much. Something for the DOH to take into acount with future contract negotiations.The tax payer is too generous, and helped create "Sweat Shops" and fat cats, for the simple art of volume dispensing, which must be discouraged, and utilization of clinical skills encouraged and rewarded apropriately. If less money went to the people at the top who historically have done nothing at all, we would all be on 40 quid an hour. It's the corporate leeches who have destroyed the industry, and the government who have also done nothing about it. Forget the RPS, they couldn't box themselves out of a paper bag.